As Leicester City prepare to face Manchester City at the Etihad Stadium this Saturday, there’s obviously one subject getting most attention from the European press. Riyad Mahrez’s strike has been getting international coverage since his first failure to show up at the Foxes’ training, and as the situation continues, there’s more to be commented on. 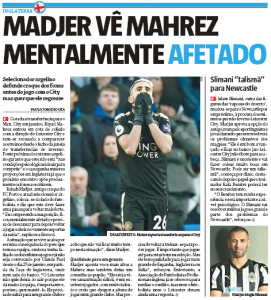 Portuguese newspaper Record has a story on the midfielder today, with sources close to him saying that Mahrez is not “in the ideal psychological conditions’ to get back to playing for the club for now. The outlet also managed to interview the manager of the Algerian National Team, Rabah Madjer. The former striker played in Portugal for five years, so he has some proximity to the local press. Madjer made sure to defend Mahrez, claiming that he knows what the Leicester City player has been through. “I understand his position, he was mentally affected and he needs to rest and then to play again and open the doors of the exit again,” Madjer told Record. And instead of trying to calm down the situation, the manager made sure to say that Mahrez deserves a better club: “He’s going through a difficult situation, he’s an excellent player with a lot of talent and I think it’s time to play in a great club.